C-3PO might not always be the bravest droid in the Star Wars universe, since he’s always quite skittish about heading into danger. But he certainly is the flashiest droid in the entire galaxy! That’s right, his shiny golden shell can be seen for kilometers across the sands of the Tatooine deserts. And just look at those glowing eyes! Yes, C-3PO is one glamorous construct of wires and metal. If your child is the flashy type, or perhaps the cautious type (we all know how prudent C-3PO is), then maybe he’s the perfect person to play the role of the iconic droid. 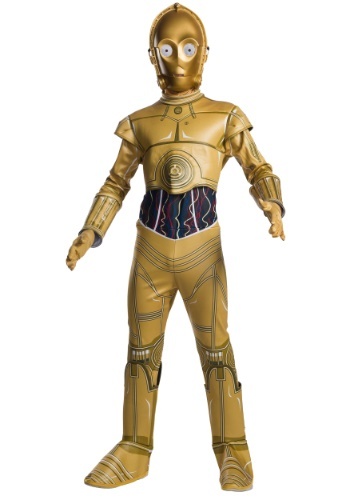 This child C-3PO costume allows your young child to assume the role of the legendary golden droid introduced in Star Wars: A New Hope. It comes with a jumpsuit designed to look like his metallic body. The gold colored exterior has plenty of printed details. The foot covers fit over your child’s shoes to continue the look. The final piece to this outfit is the molded mask, which has all of C-3PO’s features shaped directly into the mask. Once your child has the costume on, he’ll be ready to join R2-D2 on adventures across the galaxy. He’ll be ready to hang out with Luke Skywalker. He’ll be ready tell Han Solo the odds, much to Han’s chagrin. But most importantly of all, he’ll be ready to trick or treat as everyone’s favorite protocol droid from the Star Wars films.